One of the more confusing issues in gardening, especially to new gardeners, is which do I choose, potting mix or potting soil. The other day while visiting one of our favorite local garden centers to research this article we met a young lady who was confused by the array of different products available because the various commercial products tend to use the terms interchangeably. Add to this, the vast selection of specialty mixes available for different plant types and purposes. Unfortunately, this situation prevents us from giving you a hard and fast definition, but we can give you some insight on what goes into these mixtures to help you make an informed decision. Peat Moss- is an organic product derived from the slow decomposition of sphagnum moss which accumulates in bogs. The moss decomposes slowly under water. It is harvested by draining the peat bogs and collecting the material by various means. It is the most common ingredient found in North American potting mix formulations. Peat moss has no nutrient value and is acidic. Coir- is material made from the husk that surrounds a coconut. It is used for making mats, sacks and roping. The byproduct of these operations is used the same as peat moss. It is more common in areas where coconut production occurs. Its Ph is closer to neutral. 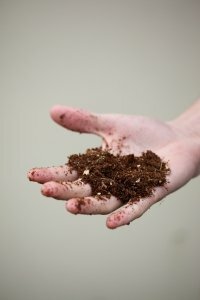 Some believe that it is more environmentally sustainable than peat moss since it is a by-product of coconut processing. It is a key component of some of the so-called "moisture-control" potting mixes coming into the market. Compost- compost in potting material consists of whatever is economically available to the manufacturer. It can be composted bark, sawdust, manure or any other rotted organic material such as leaf mold, forest debris or mushroom growing material. Humus- this term is generally used interchangeably with compost by commercial manufacturers of these materials. Humus is a component of compost for all practical purposes. Sand- sand is used to add body to the organic material in potting material. It provides air spaces. The weight it adds in containers will help with top-heavy plants. A good grade of sand to use is so-called mason's sand. It is washed and has particles up to 1/8" in diameter. Play sand is usually too fine to provide proper root aeration. Limestone- Peat moss has a pH of 4.0-4.5. For this reason, limestone dust is often incorporated into potting materials to buffer the acidity of the product. Perlite- is a volcanic material that is heated until it expands. It is a light weight material that is chemically inert but like sand adds porosity to the mixture. Vermiculite- is a form of Mica that like perlite, is heated until it expands, and performs the same function. Both are ideal for use in hanging baskets. Soil- soil is another term that can have broad meanings. You will see the terms loam, top soil, garden soil and of course, potting soil, just to name a few. Most gardeners tend to think of soil as dirt. Products that contain no dirt are sometimes referred to as "soil less." The soil used in commercial mixtures can come from any source and is usually not identified further. Mixtures containing soil are generally heavier, so they are not suited for large containers or for starting seeds. Fertilizer- many commercial mixtures contain fertilizers, either organic or in-organic. As mentioned above, many of these mixtures are for specific plants. It is not generally recommended to use mixtures containing chemical fertilizer for starting seeds. These harsh chemicals can easily burn the delicate roots of newly sprouted seeds. The many different products that are available commercially serve different purposes so they will contain greater or lesser amounts of the above materials depending on the specific purpose. We do not advise using soil from the garden for indoor plants and seed starting. The soil may contain insects or soil born pathogens. If you do use soil from the garden or wherever, it should be sterilized by heating in to a temperature of 180° F for 30 minutes. You will want to do this outdoors or with the windows open because it may have an unpleasant odor. Moisten the soil lightly and spread it no more than 3" thick to allow for thorough heating. Covering the pan will help to retain the heat. Be very careful when handling the hot soil as it will burn you badly. Be especially careful when lifting the lid off of the pan because the steam will be very hot. Let the mixture cool before handling or using. This is a potentially hazardous operation, keep children away and be sure that you have proper ventilation. So you see, you really have to pay attention to what you’re buying. Check the bag labels carefully to make sure you’re buying the proper soil or mix for its intended use. That will ensure better plant growing success. In any of the books available for plant propagation you will find a variation of this potting mix formula. You can experiment and find out what works best for you and the plants you are trying to grow. For example, leave out the sand for hanging baskets or add more for larger plants in containers, it's up to you.